Whenever I'm in the planning stages for a new novel, one of the things I try to do is get a clear picture of what my characters look like. I believe we as writers need to know as much as possible about how our characters look if we want them to come to life. I build my character's appearance in numerous ways. I also fill out an extensive character worksheet that includes the physical aspects of how my character looks. I make notes of every detail including height, weight, body type, scent, texture of skin, and other distinguishing physical traits that are unique to my character. 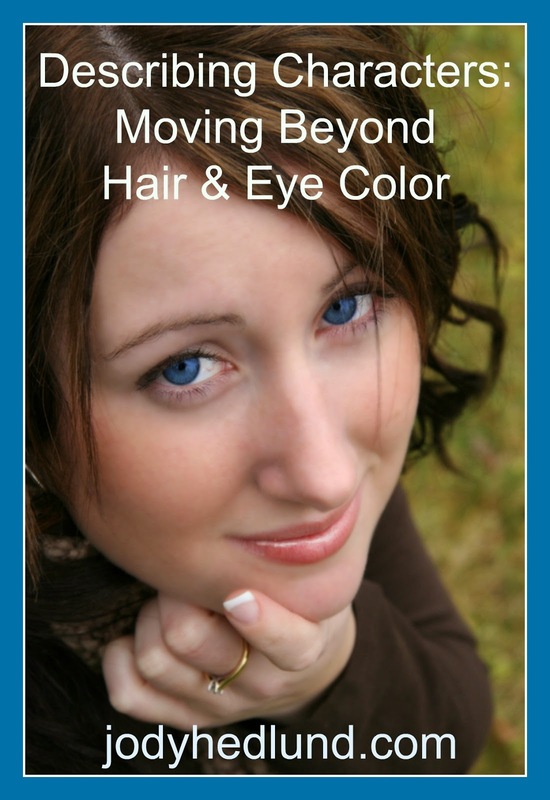 Obviously as part of the description, I include eye and hair color. One thing I've noticed, however, especially among newer writers, is that sometimes we can rely too much on hair and eye color in our descriptions of our characters to the neglect of other techniques. 1. Main characters will likely need hair and eye descriptions (especially in certain genres like romance). In fact, we should help our readers to visualize our main characters correctly right from the start (versus confusing them two-thirds of the way through the book by springing an image on them that might not match the person they’ve already visualized). However, these kinds of basic descriptions can be done in creative snippets that are subtly woven in. 3. Give our characters unique tags. A tag is something that will help identify a character throughout the book. Tags can be physical (a bulbous nose), verbal (a particular phrase only that character uses), characteristic (timidity), or an action (nail-biting). I've had to learn to be careful about over-doing my tags. Mentioning them every time a character makes an appearance can get tiring. Which leads to the next point . . .
4. Remember description is only a small part of bringing a character to life. In fact, description alone is not enough. We must weave the sharing of their physical appearance among other techniques—how our character reacts to situations, her goals, her method of handling conflict, the way she enjoys life, etc. All of these little things come together to leave an impression in the reader’s mind about who that person really is. For example if a character is particularly worrisome, she can wring her hands and say "oh dear." But more than that, we should have her display her worry by hovering closely over her children, reminding them not to forget their lunch money too many times, and watching them cross the street even though they're in junior high. My Summary: We can't forget to describe our character's physical appearance, but like most aspects of writing—we have to reject the easy (often clichéd) image that comes to our minds first. Instead we need to brainstorm, dig deeper, and find creative, interesting, and unique portrayals that will delight our readers. But ultimately physical description is only the tip of the iceberg in bringing a character to life. Actions always speak louder, even in our characters! How about you? Have you fallen into the eye and hair color description trap? How do you push deeper to find more unique ways of describing your characters? Where can we find your character worksheet? I started a new novel yesterday and fell into the hair description trap in the second line, but it's important to the character and I immediately found other ways to describe her personality through her interactions with other, far more minor, characters. For now, I'm leaving the hair because it's a darn good line for a first draft. I was just reading Meant to Be Mine by Becky Wade the other day. She did a good job of subtly inserting descriptions. Since it is a contemporary romance she got away with just saying that one minor character reminded the hero of a particular actor. That's all she said. I looked up that actor online and could see what she meant right off. Another neat thing was how she described the old kitchen appliances in a bakery. Instead of saying that they were from the nineties and not the eighties, she said they were from the Clinton era and not the Reagan! I thought that was a creative way of letting one know the style of decorating without detail. Jody, I do a little character sketch for everyone who appears at least twice in any of my books. Don't forget to decide what kind of car they drive--it's amazing how often this is needed. Thanks for sharing. So true, Jody! The one thing that irks me is when the characters describe themselves when looking in a mirror. For my characters I try to find a way to have them described by someone else like a person asking if they colored their hair, a mention of contact lenses to change eye color etc. I'm writing my first novel and am realising that all of my female characters are the same. Thanks for these tips, I'll keep them in mind as I rewrite to give them each a different life! Physical description is difficult for me; I often forget it in the first draft or all of my male characters in particular end up looking the same. For some reason it's easier for me to describe women; I read in a Whitney Otto novel that women study each other's appearances, like the way we admire each other's clothes or hairstyle. This post is really helpful Jody! I've always found it useful to make a clear list of common flaws of characters. So often in books we read about these people with unattainably perfect qualities, but if you make it obvious what their flaws are, that can be eliminated. In addition, it always seems to make me want to defend my characters and give them awesome and unique strengths. I love this post! So helpful! Thank you. I am baby stepping my way around. You are such a wealth of information, Jody. I always write notes when I read your posts. Great advice! But I somehow read some stories that where not really describing some character, some of it would describe characters in some necessary scenes.